Thanks to Sherri’s blog I was led to ‘A Lingering Look at Windows’. If, like me you find windows fascinating you should take a look at the current challenge to post a photo of a window each week. I am awed by stained glass windows especially, and have an enormous collection of photos from around the world. But very close to home there is a window that fascinates me. It is in Gloucester Cathedral. 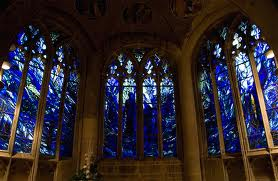 It is quite a modern window and from a distance with a cursory glance, it can appear to be simply random shapes of blue glass. On closer inspection though, this window draws the viewer in rather as an icon does. It is a meditative experience to sit and really look at this window. Soon the shape of a man appears then you are drawn to the face. It has a haunting expression of deep understanding and empathy. It represents the face of Jesus. The window was created and installed in 1992 by Thomas Denny. It is mainly blue and white with splashes of red and yellow. It is greatly affected obviously by the light coming from outside but it does appear to be in shadow when the viewer is at a distance, then as you get closer it gets brighter and quite mesmerises me! Doubting Thomas and Jesus are the central characters of the middle window and the two side windows are a song of praise for creation based on psalm 148. Thomas Denny, was born in London. He trained in drawing and painting at Edinburgh College of Art. One day a friend asked him to consider creating a stained glass window for a church in Scotland (Killearn 1983). So began a remarkable career that has produced over 30 stained glass windows in Cathedrals and Churches of this country. (Visit http://www.thomasdenny.co.uk for the full listing.) Tom’s love for painting and drawing, especially the things of nature, is evident in his windows. All of Tom’s windows depict biblical themes and encourage the viewer to sit in silent meditation. Look closely, feel the colours, take the time to let the details emerge, then reflect. It is a spiritual experience.